Dr. Shay Harrison speaking at Columbia’s “Dinner with a Scientist” event in the school library. 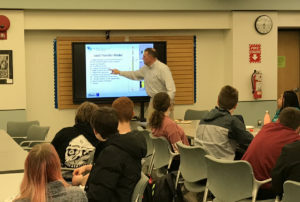 Columbia High School’s new club Serious About Science hosted its first “Dinner with a Scientist” event in the library last week with keynote speaker Dr. Shay Harrison. About 20 students attended the event to learn more about career paths in science. Dr. Harrison, a Columbia alumnus and the former Board of Education president, is a materials engineer at Free Form Fibers. He discussed how to become a scientist, what it means to be a leader and offered strategies for dealing with and embracing failure. For failure is an integral part of science, life and learning, he said.